Enjoy a full gold leaf facial kit unlike any before. CleAurum provides two exciting products for the cosmetic industry, and cosmetics enthusiasts. Our 24K Gold Leaf Mask is a great way to receive a luxurious facial experience unmatched by any other product on the market. 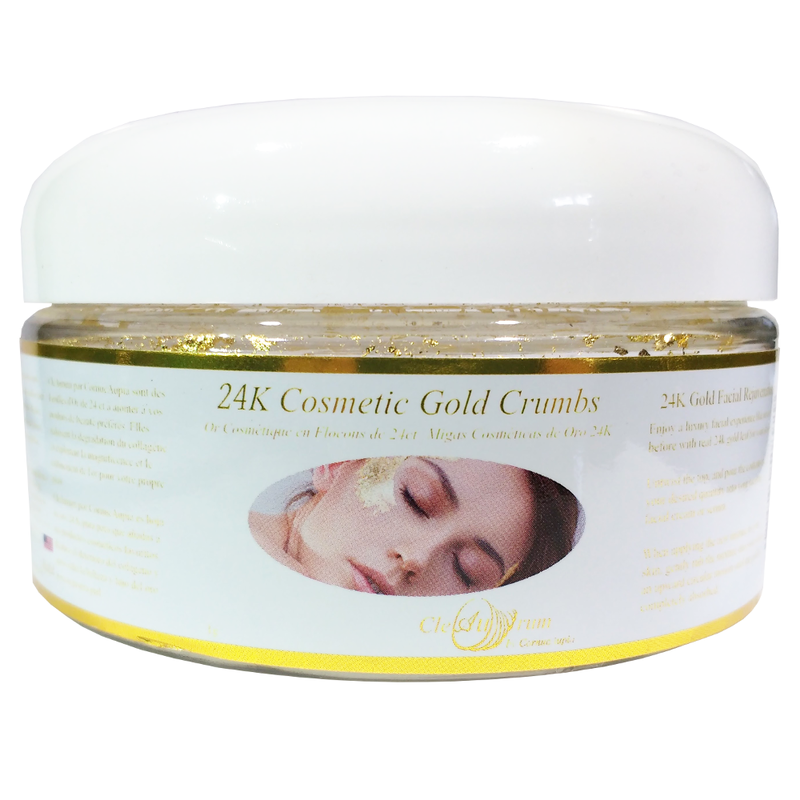 In addition to the gold leaf facial experience, you can enjoy your favorite cosmetic creams and serums with real 24K Gold by using our 24K Gold Leaf Crumbs cosmetic additive. 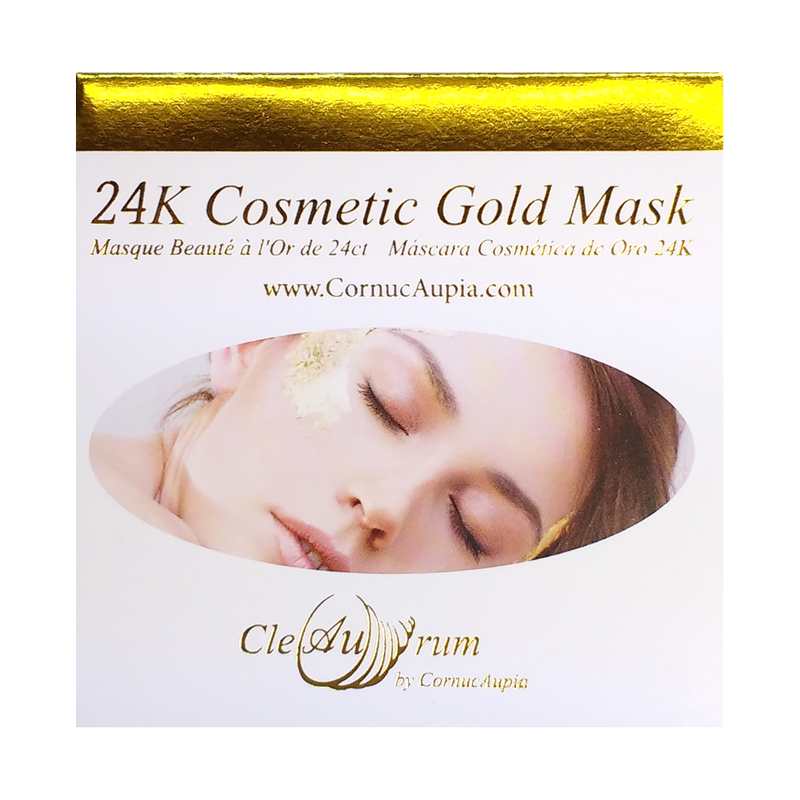 Simply pour our real 24K gold product into your favorite cream and mix to use as you have previously. These two products combine to create a gold leaf facial kit experience that is both novel, and familiar, with an enhanced experience that will leave you feeling pampered and beautiful. Our gold facial kit related products work by to circulate blood through the skin gently and allows the other ingredients to penetrate deeper into the skin. On the microscopic level, the collagen of the skin as been boosted and restored, ensuring that the skin will remain firm. It also reduces the collagen degeneration that causes aging skin. As a result, you can expect a beautiful radiant glow, and a lasting youthful appearance using our gold leaf facial kit. Consistent application of our gold facial kit products will inhibit the breakdown of elastin, slowing the aging process significantly. All the while re-energizing the skin with the energy it needs to remain smooth and youthful. Cornucapia’s pure gold facial kits are the solution to wrinkles and fine lines caused by stress. It was used by all the beautiful royal Queens and mistresses of ancient times, and if it worked for them it will surely work for you. gold facial kits are a luxurious way to put a smile on your face and a matching beautiful glow to your skin. gold facial kits are universally appropriate for all skin types including oily skin, combination skin, sensitive skin, and normal skin. A gold facial kit will make a difference after just the first use that you can see. Pure gold facial kits are now available at affordable prices for all to enjoy. The benefits of pure 24K gold are now once again being used to maintain and restore beauty to the world on a large scale. This is the product your skin has been waiting for. See for yourself how beauty and pure gold facial kits go hand in hand – the uplifting and rejuvenating power of gold is in your hands.